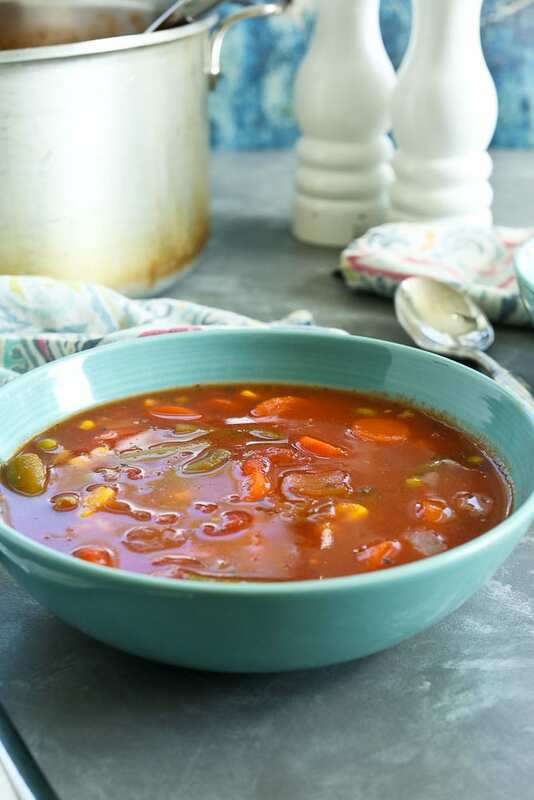 This 15-Minute Vegetable Soup is a quick and easy recipe for when you want a healthy, homemade soup, PRONTO! This post is sponsored by Refreshingly Real and the Can Manufacturers Institute. All opinions, as always, are my own. 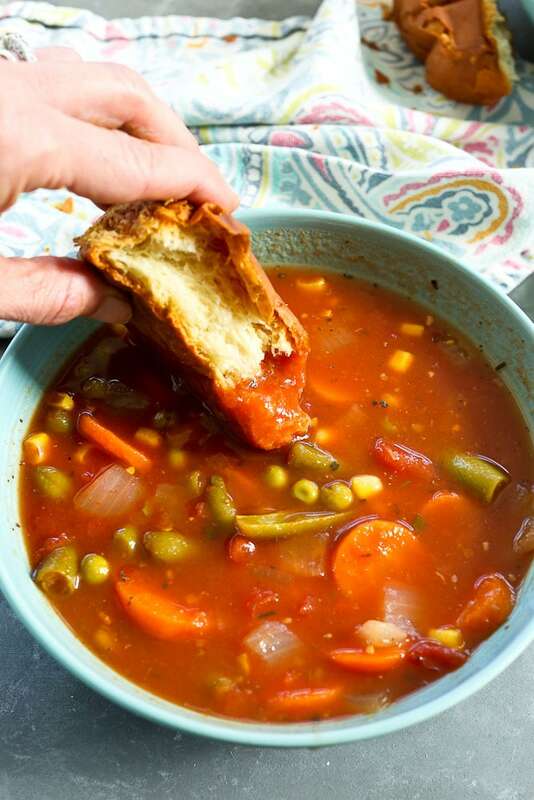 Soup season is the best season. Raise your hand if you’re with me on this one. Since I can’t see you, I’m just going to assume everyone has their hands up high. Since we all agree, I’m going to tell you why I am the happiest girl alive right now. It’s because I can have this healthy, homemade soup in 15 MINUTES!! Seriously. Like right now, I could walk to my kitchen, and in 15 and a half minutes be eating this soup. Keep your pantry stocked with some canned vegetables, and you’ll be able to do the same. 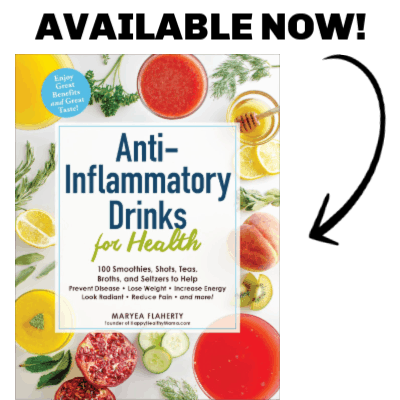 Ever since I went on the Farm To Can Tour put on by Refreshingly Real last month, the ideas for convenient and healthy recipes using canned foods have been nonstop. I was so excited to learn that most foods make it from the farm to the can in about four hours! Talk about getting the food at the peak of the nutrition and locking it in. And you sure can’t be the convenience of canned foods. It’s a win-win. All you have to do to make this soup is start with a fresh onion and garlic and let that sauté for a few minutes. This will give you some great flavor. Hopefully you at least have a fresh onion hanging out, right? Then you do need to open a few cans, but guess what? Usually when you make homemade soup there’s a whole lot of chopping involved. Not here. We get to skip most of the chopping!! Which Vegetables go in Vegetable Soup? These are the vegetables I used, but you, of course, can switch things up to include more or less of your favorites. Customize to your liking! 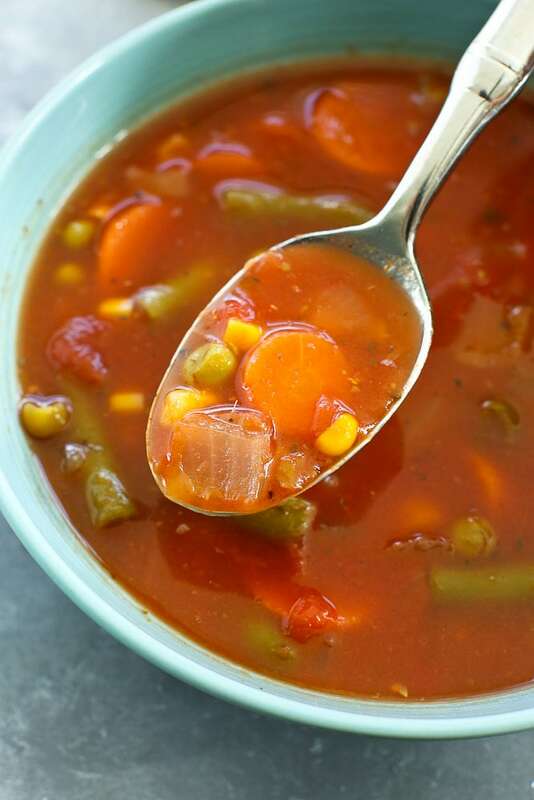 I know corn and peas and not technically vegetables, but I always include them in my vegetable soup. You can serve this with some crusty bread and a quick salad and you’ve got yourself a healthy dinner, ready in less than 20 minutes. I think it’s going to make you very happy, too! ENJOY this one, friends! 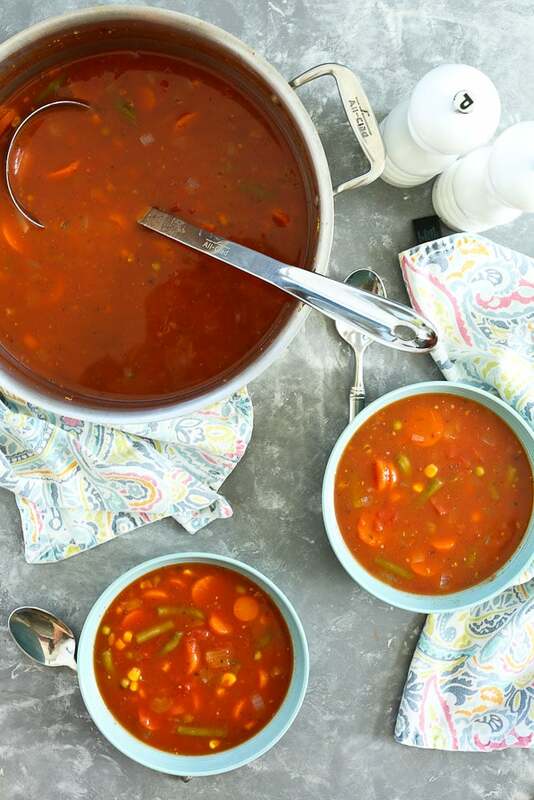 This is the EASIEST vegetable soup recipe ever! Heat the oil in a large stock pot over medium heat. Add the onion, garlic, Italian seasoning blend, salt, and pepper and sauté for 5 minutes. Add the rest of the ingredients and bring to a simmer. Simmer for 5 minutes. You might also love this Vegan Mushroom Soup!